Virtually unbreakable and sealed against contamination. 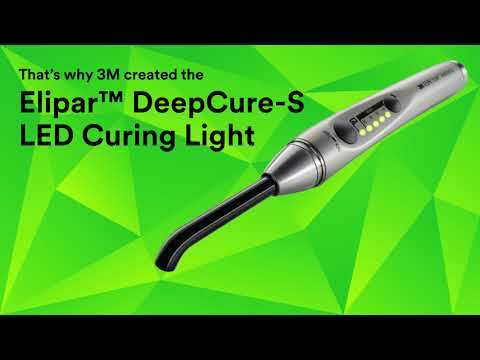 When you hold the seamless, stainless steel Elipar™ S10 LED Curing Light from 3M ESPE, you can feel product excellence at a whole new level. Its one-piece stainless steel casing is virtually unbreakable. And because the casing has no seams or vents where liquid can seep in, internal components are protected from contaminants. Hygiene control on a whole new level. Like other dental hand instruments, the curing light comes in direct contact with your patients, so hygiene is of upmost importance. That's why stainless steel makes perfect sense. The smooth, vent-free, stainless steel exterior allows fast and easy disinfection between patients. The stainless steel surface is also resistant to discoloration and staining from disinfectants and dental materials. Assurance of a complete cure in challenging situations. *Compared to leading devices tested. ¹List of tested materials is available. A complete cure of adhesives, filling materials and cements is essential to the long-term success of restorations. However, curing can be challenging in some situations. An inadequate cure may result in decreased strength and stability of the final result, as well as restoration failure. Photograph of the streak light on paper of the output beams of the Elipar™ S10 LED Curing Light and a competitive LED curing light (8 mm light guide). The beam from the Elipar S10 light has a smaller angle of beam spread resulting in a higher maintained intensity at a distance. Due to its more focused light output, the Elipar™ S10 LED Curing Light offers improved depth of cure when curing from a clinically relevant distance of 7 mm. Illustration of a clinical situation: Curing of a large Class II restoration in a typical lower molar. The Elipar™ S10 LED Curing Light offers more illumination surface, allowing the full cavity surface to be cured in one shot. The advanced Li-ion battery provides mobile, cordless operation. A new fully-charged battery provides 60 minutes of cure time (or 360 10-second cures). Indicator LED shows level of battery's charge. Battery can be fully recharged in 90 minutes. To maximize efficiency, the Elipar S10 LED Curing Light offers all of the features you want, and not ones you may never use. Simple two-button operation with one cure mode for all indications. Tack cure mode. Silent operation—innovative design eliminates noisy fan, and includes option to turn off beep signals.